The Tissot Superpole Race for the MOTUL FIM Superbike World Championship provided exciting action from lights-out to the chequered flag. For an eighth successive race, it was Alvaro Bautista (ARUBA.IT Racing – Ducati) who took the win, becoming the first Ducati rider to win eight races since Troy Bayliss in 2006. Off the line and Bautista was yet again the rider with the best start, leading into Turn 1. 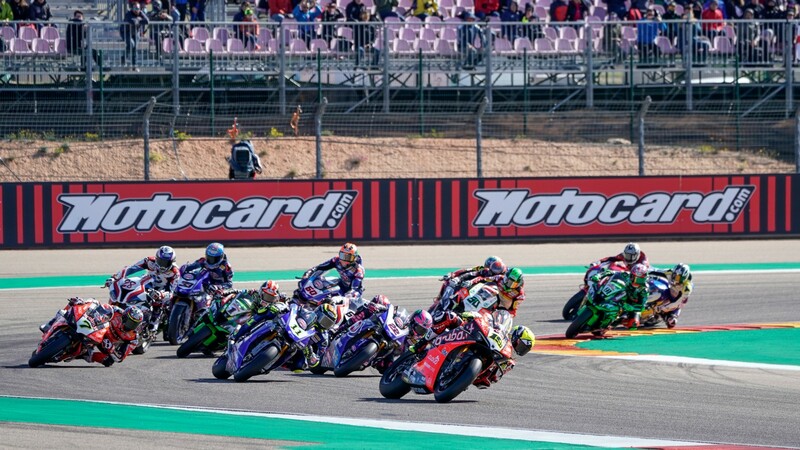 However, there was mayhem behind as Michael Ruben Rinaldi (BARNI Racing Team) and Michael van der Mark (Pata Yamaha WorldSBK Team) collided and crashed, ending the Dutchman’s 22-race streak of point-scoring positions. He finished 15th in the end, whilst Rinaldi went to the medical centre. Bautista soon cleared off at the front, leaving the battle for second to rage on like in Race 1. Sandro Cortese (GRT Yamaha WorldSBK) was running second until Alex Lowes (Pata Yamaha WorldSBK Team) made his way ahead at Turn 12. 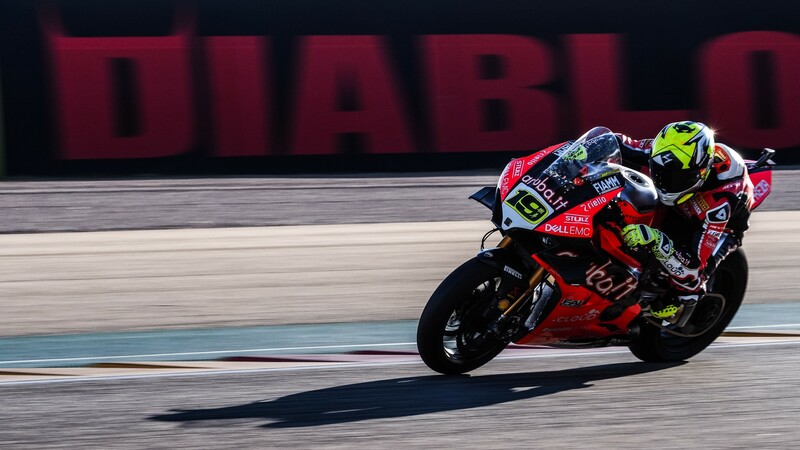 Chaz Davies (ARUBA.IT Racing – Ducati) tried a similar move a lap later at Turn 16 but couldn’t make the apex, running wide and dropping down to fifth – allowing rival Jonathan Rea (Kawasaki Racing Team WorldSBK) to make up a position. Soon, it was a similar race to yesterday, as Tom Sykes (BMW Motorrad WorldSBK Team) and Eugene Laverty (Team Goeleven) battled hard. Ahead of them, Sandro Cortese was starting to drop back through towards them as Lowes, Rea and Davies had all finally made their respective moves on the German Rookie. With five laps to go, there was another retirement as Markus Reiterberger’s (BMW Motorrad WorldSBK Team) miserable weekend continued, this time with mechanical gremlins. His teammate Tom Sykes was enjoying a much better race, having dropped down to seventh after the opening lap, he was now fifth and pushing hard for a second consecutive top five of the year. The battle for second was starting to take place though, as Lowes slipstreamed his way passed Rea down the back straight, achieving the move at Turn 16 with just five laps left to go. Two laps later, Rea almost hit the rear end of the Yamaha-man at Turn 1, allowing Chaz Davies to now get in on the action. A lap later, it was a shoot-out and Rea tried to get ahead of Lowes at Turn 1, but the Englishman fought back. At Turn 4, Rea finally fired his way through and despite Lowes looking to fight back, Rea held on. The final lap soon beckoned but no moves were made, despite Lowes’ best efforts. 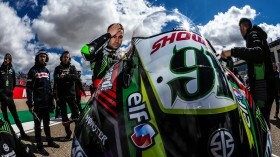 However, it was the dominant Alvaro Bautista who took yet another win in his WorldSBK career, holding on ahead of Rea and Lowes – making it three different manufacturers inside the top three places for the fifth time this season. Chaz Davies was a solid fourth, whilst Tom Sykes and Eugene Laverty completed the top six; the front two rows lining up exactly like that. Row three will look see Leon Haslam (Kawasaki Racing Team WorldSBK) in seventh, after a fairly quiet weekend which has seen him absent from the front. Joining him on the third row will be Jordi Torres (Team Pedercini Racing) and Sandro Cortese (GRT Yamaha WorldSBK) in eighth and ninth respectively. 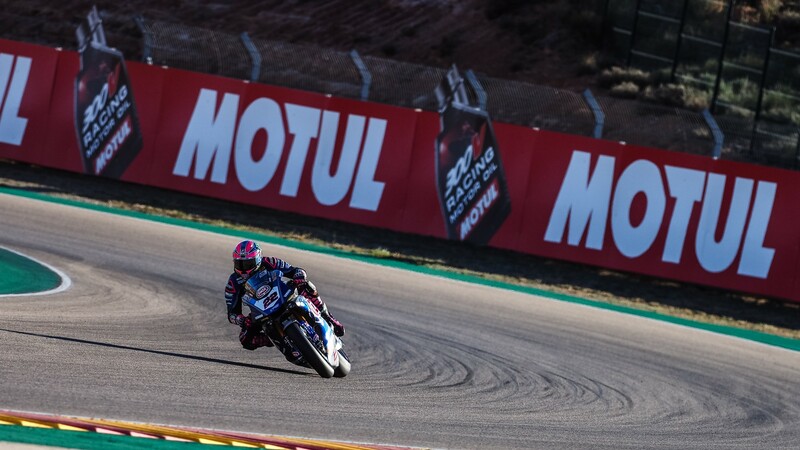 Make sure to watch the remainder of the Motocard Aragon Round with the WorldSBK VideoPass!